With a stay at Sea Mist, you'll be centrally located in Myrtle Beach, within a 5-minute drive of Family Kingdom Amusement Park and Myrtle Beach Boardwalk. 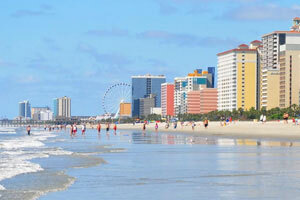 This beach resort is 1.8 mi (2.9 km) from SkyWheel Myrtle Beach and 3.3 mi (5.3 km) from The Market Common. Make yourself at home in one of the 740 air-conditioned rooms featuring refrigerators and microwaves. Rooms have private balconies or patios. Complimentary wireless Internet access keeps you connected, and cable programming is available for your entertainment. Bathrooms feature shower/tub combinations, complimentary toiletries, and hair dryers. Make a splash in one of the 2 indoor and 9 outdoor swimming pools and enjoy other recreational amenities, which include a water park (surcharge). This resort also features complimentary wireless Internet access, an arcade/game room, and gift shops/newsstands. Enjoy a meal at Tenas Breakfast or snacks in the coffee shop/café. The resort also offers room service (during limited hours). Relax with your favorite drink at the bar/lounge or the beach bar. Buffet breakfasts are available daily from 7:00 AM to 11:00 AM for a fee. Featured amenities include express check-out, a 24-hour front desk, and laundry facilities. Planning an event in Myrtle Beach? This resort has facilities measuring 17000 square feet (1579 square meters), including a conference center. Free self parking is available onsite. The preferred airport for Sea Mist is Myrtle Beach, SC (MYR). Only bookings from non-local guests are accepted. Guests whose residence is within 20 mi (32 km) of the property will not be allowed to check in. Please note that cultural norms and guest policies may differ by country and by property. The policies listed are provided by the property.